Dynamic control of PPARδ expression after skin injury. 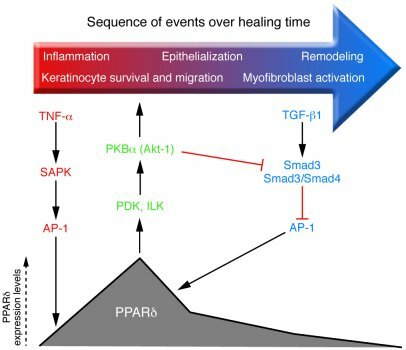 Left: TNF-α released by injured epidermal keratinocytes activates stress-associated protein kinase (SAPK) and induces AP-1 binding to the PPARδ promoter and transcription of PPARδ target genes. TNF-α also triggers production of endogenous PPARδ ligands, which activate PPARδ in keratinocytes and macrophages. Center: PPARδ activation helps maintain a sufficient number of keratinocytes for re-epithelialization by improving apoptosis resistance through expression of integrin-linked kinase (ILK) and 3-phosphoinositide–dependent kinase (PDK), as well as via activation of the PKB/Akt-1 survival pathway. Right: The initial inflammatory signals that stimulate PPARδ are countered by TGF-β1/Smad3–mediated suppression of PPARδ in the late re-epithelialization/remodeling stage. This suppression occurs via Smad3/4 complex–mediated abrogation of AP-1 activity. In addition, TGF-β1 released by dermal wound fibroblasts increases macrophage numbers and stimulates ECM production for wound remodeling. The diverse cell types and feedback signals regulating would repair are discussed in detail in the text.